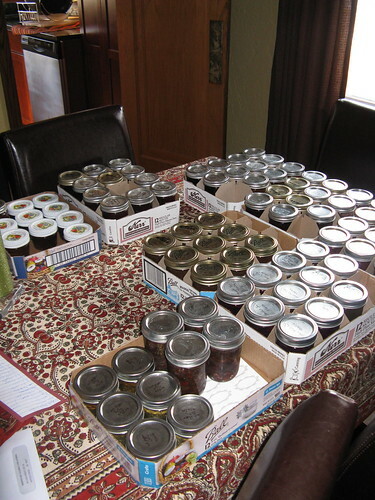 If you've been following us at all through this summer you know we've done an awful lot of canning. Much of it we will eat ourselves but we also planned on giving a lot of it away as gifts for the holidays. 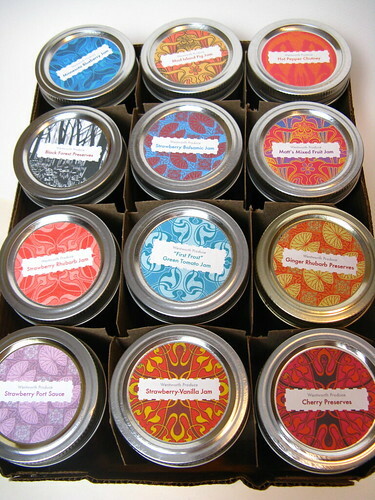 Home canned jams, relishes & salsas make great gifts but we wanted to make them look as good as they tasted so, Matt came up with these beautiful labels. They were really quite easy to make. 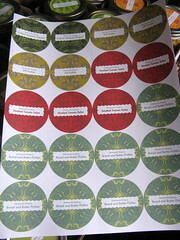 The labels were created in Pages (you could use Word as well). First draw a circle that is 2.1" in diameter. 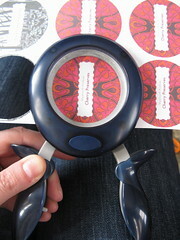 Then chose image fill & pick the image of your choice to fill the circles, Matt found the ones we used online. Next create a text box & type information for what is in the jars & center the box in the circles. Matt changed the color of the fonts to match the background. Finally group the circle & text box, then copy & paste it to make multiple copies on a page. 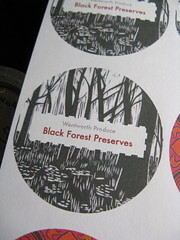 For some items like First Frost Green Tomato Jam & Port Wine Jelly we wanted to give ideas on how to use them so we created little labels to tie on to the jars. 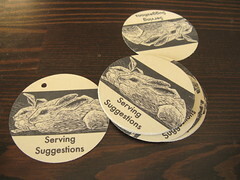 We use the same method of designing the circles & printed them on card stock. We punched a small hole in them & then tied them on with this two colored twine from IKEA. Finally, we packed everything in these pretty paper bags we found at Michael's (13 for $6.99, what a deal!) 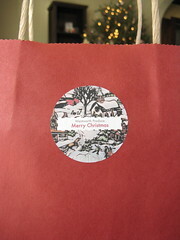 & then put a Merry Christmas sticker made the same way on the bags. kat & Matt, you both are incredibly creative; not just in your culinary skills, but as shown here in your giving! I have always felt that a gift that was made by the giver is the best of all. You are truly a renaissance couple, who live life completely. Merry Christmas and a Joyous Healthy New Year! You guys are amazing! What wonderful goodies! I hope I am this organized next year! I love seeing your creativity. I make all of the gifts I give for the holiday and sometimes wonder if I'm crazy for doing so...but it helps to see I've got other crazies out there with the same notion - that a gift from the heart is the best gift. This year...no jam but some cranberry liquor. Bottling today! So very very nice! Great job on the labels. Your recipients are lucky people. 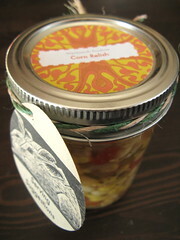 The preserves were already such a nice gift, the presentation makes them prefect. That is such a thoughtful gift! Oh wow, those are a lot of goodies! This is such a creative and personal gift. It's truly a labor of love, and I am certain that the gift recipient will recognize all the care put into it. I absolutely love your designed labels! Whoever shall receive these gifts are very lucky people!!! Thanks for sharing and for posting a wonderful inspiration! super cute! love the labels! These look just amazing! So creative - I'm deeply impressed! I would die of happiness if someone gave me a gift that looked like that! How adorable! You should sell them with blank text boxes in your etsy store. Wow- these are beautiful and what a super idea. I need to do this next year. I have given my friends their presents already. Love that huge circle punch. SInce I am always cutting out circles this would be ideal for me. Oh thanks Kat! Always a good idea here. All the products are too great and packaging is superb and fantastic. You guys are amazing! 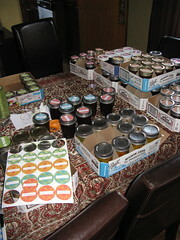 You're so inspiring and I am looking forward to dressing up my jars of canned goods this year! These labels are too adorable!